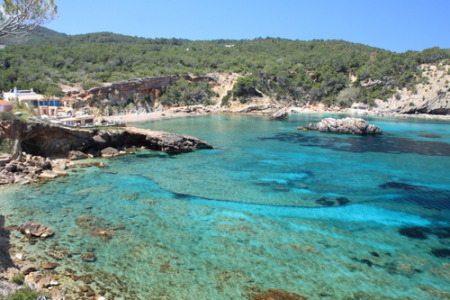 If you are looking for sun, sand and sea, a cheap Es Cana holiday will fit the bill. The resort lies around a wide, sandy, crescent shaped bay. With the clearest of shallow waters, young children can paddle in safety and novice swimmers will gain confidence. Although the waters are safe, children of course must be supervised at all times. A variety of water sports are available. Some are merely for paddling gently along the shore while others suit the more energetic holidaymaker. If you wish to explore other areas or want to take a trip to Ibiza Town, take a boat rather than the bus as you get great views of the town from the sea. If you find a cheap Es Cana holiday appealing and you wish to avoid the tedious task of trawling through web page after web page trying to find the best deal, try our simple search facility. You'll find over three dozen travel companies competing for your custom. It is simple to use and remember, competition brings out the best bargains. Our search facility enables you to see, at a glance, the Es Cana holiday that is the cheapest and the one that offers you the best value for money. All you have to do to secure the holiday is make a phone call. To book the best deal, and to avoid disappointment, ring today.